Curious if any owners of the MTH RailKing Aerotrain have made any upgrades or detail improvements to give it a more scale appearance? Pics or videos would be great! I don't understand "scale appearance"? the train is scale. it's the performace of pulling all ten cars that is the main issue. the other would be the lighting. the rear should have one red light and one white [back up] light. the front center light should be red and lit when the train is in reverse. By scale appearance I was thinking what could be done to make look more like a Premier set rather than RailKing. I’m thinking I want to order the set with one add on from the new catalog so I’m guessing performance shouldn’t be a problem. Thanks for the info on the lighting! The design hasn't changed I suspect. I have the earlier PS/3 version and a PS/2 one that I'm going to convert to TMCC. For both of them, I had to tinker with the rear truck to get decent performance. I have my PS/3 one pulling the ten cars around the club, including the 2% grade, so I think that one is done. I believe the other one will probably do it as well, but I'll wait until I do the conversion to tinker with it's trucks. Adding weight will probably help as well. So gunrunner, I have a PRR ps2 set. Is it worth getting the PS3 version and selling off the Ps2 version? Does the PS3 version have led lights to prevent a meltdown? Not a lot of detail on the real deal Aerotrain. The PS/3 one does have LED's, but you can easily swap out the PS/2 lights for LED bulbs, a 220 ohm resistor in series with a white LED is a perfect substitute. 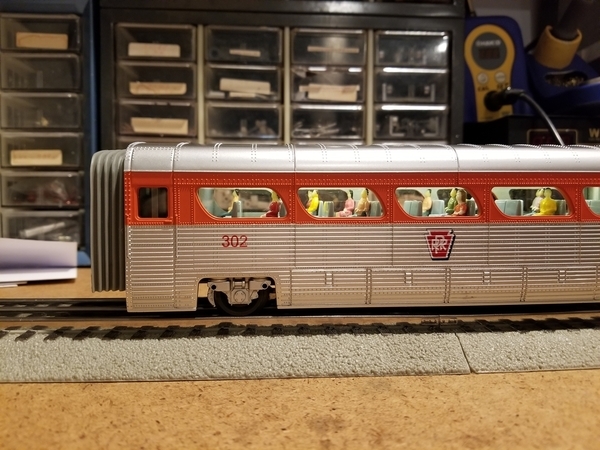 The way the MTH Aerotrain was designed and made is how they should have made the TurboTrains. The nightmare 10 pin lines tethering through the train is the major weakness of the TurboTrain, be thankful they simplified the Aerotrain. A lot of people do not like the General Motors Aerotrain; I rather do, even though it has an unfortunate and not-coincidental frontal/windshield/"grille" resemblance to the perennially ugly 1959 Chevrolet. I do not have one; but I think about it. I would love to see a rendition of the NYC's lightweight Baldwin "Train X". Better yet, the Gulf, Mobile and Northern's (later the Gulf, Mobile and Ohio's) ACF/Alco lightweight Rebel, a very early air-conditioned (yay!) streamliner running eventually between St. Louis and the Gulf Coast (Mobile and New Orleans). The Rebel was a better design than most early streamliners, like the Zephyr, as it was sleek but not articulated, and cars could be changed out at will, which would make the model easier to deal with, too. Well, the Aerotrain just has the engine and what passes for normal passenger cars, so no need for a tether. They did cry out for LED's, so I did that to my ten cars. Good point. However they could have had the rear TurboTrain power car start independently just like two E-8 locomotives do. I want to have the Turbotrains reworked somehow, so far some big names in train repair have decided to not attempt a rework. I really like the Aerotrain. I am somewhat biased in my affection. I would see it every afternoon on The Mainline during it's brief stint going from NY to Chicago. 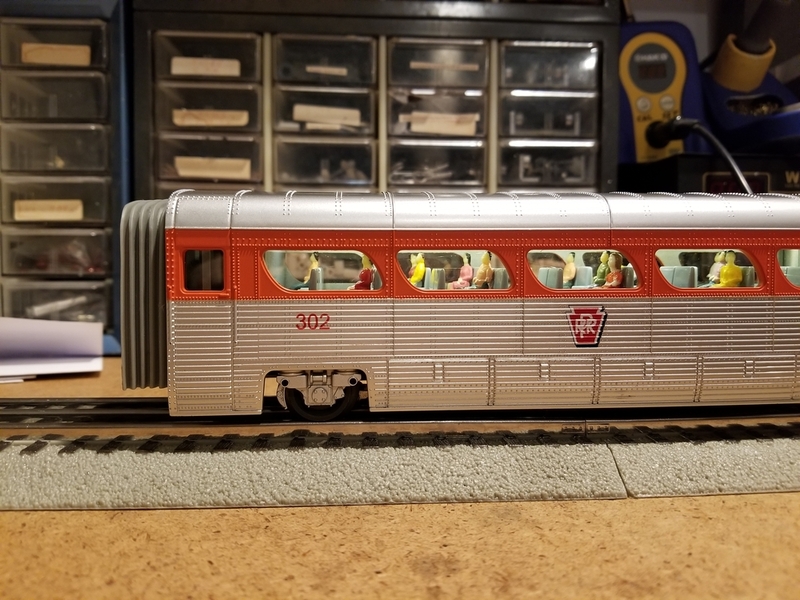 I have the first model with all of the cars,TMCC and EOB. It runs very well. I guess that it is semi scale. I would go for a scale Aerotrain. I believe the RK version is supposed to be scale, but I can't find any specifications for the real locomotive. What model came with TMCC, and who made it? I converted my engine to TMCC and EOB from the PS2. That makes sense, I'm going to do the same thing with my second one. I'm also going to see if I can add smoke. You can fit people in the cars easier. I used 1:43 people and most of the time they lose their legs in regular cars. I had little to no leg cutting with these cars. Absolutely love the Aerotrain!! It's photo was on the cover of a book titled " The Wonderbook of Trains " which I used to check out of my elementary school library often. ( So often, in fact, that my teacher would not let me check it out until I checked out at least 2 other non train related books. ) I would just stare at that beautiful locomotive and dream. At the time I thought it was the coolest train ever! Obviously the General Motors auto designers had a large hand in creating this train. One would have to admit the designers of this train were thinking outside the "traditional" locomotive/train design box. Too bad GM did not work out the bugs with the original train sets and improve the design ( basically the suspension system ) to operate the Aerotrain as originally intended. Seeing one of those babies jet down the mainline at 100 mph in the late 50 thru the 60's would have been a beautiful sight! ( at least to me ) Perhaps the Aerotrian with its futuristic aerodynamic styling ( resembling space age tech, and sleek automobiles ... both of which were the dominate cultural craze at the time ) could have lured some of the traveling public back to the passenger train. I'd like to think that this train could have had the potential of becoming a real high speed train of its day .. capable of 125 mph or even more ... if GM had kept improving upon its original overall design. My guess is that GM didn't sense there was enough demand by the railroads and general public to warrant any further development. Of course when I discovered that MTH made the Aerotrain, I had to have it. So I bought one with Pennsy markings. If one were ever produced in scale I'd definitely pull the trigger and buy it! Tim, how do you get the figures in ok where you can see their heads when you look through the windows? Every figure I have tried sits "too tall" and you can't see their heads through the windows. I use the MTH passenger figures and they are fairly small. Here's one with the commonly available Chinese figures. I find the GG Little People or the Lionel people are similar sized. The BEEP people are too big. They fit in without having to cut off their legs or drill out the seats? Were you able to put any people in the back of the last car (the seats that look out the back window? The detail I would like to see is a 3D printed, chrome plated, script "Aerotrian" emblem to go over the existing decals on the side of the locomotive. This would include, of course, the circular red/white/blue stylized emblem in front of the text. I still have my original MTH one from the first release-I have run the daylights out of it. What is the issue with the lights vs. LED's-is the a melting issue? What LED's should one use and is there any requirement for a diode or other circuitry for them? oi recalled the cars being GM Bus bodies and found this. If you have a side view you could scale the dimensions off of it. "The completed train sported a 10-car consist and ironically, was modeled against the very competition trying to put passenger trains out of business, the intercity bus. The cars were only 40 feet long, half the length of standard designs, thereby reducing the weight by 50%." Pretty close, the body is 9 1/2" long. Yes, the left edge is at the end of the car, it's the angle that makes it look short. As I recently found out myself, the story that the Aerotrain coaches were converted bus bodies is an urban legend, as they in fact predate GM buses with similar styling by a few years. GM certainly got some ideas for design and construction from that department, though. I doubt they converted bus bodies, they just used the same design, and I'm sure as much common stuff as they could since these were simply prototypes to prove the concept. Windshield wipers and real grab irons are the only detail additions that I could think of. MTH has been painting rubber grommets around windows for several years, and I would assume that, on the new release, anywhere there was a prototype rubber grommet, it will be black. The prototype photo of the museum LWT12 shows additional nose grab irons that were exclusively Rock Island and not on the original versions of Aerotrain that ran on other railroads. Are not the wipers on the model's windshield? What? You mean those cast-on lines on the windshield glass? I was thinking of applied castings of windshield wiper arms and blades, mounted on the ridge above the windshield as on the prototype. The cast-on "wiper" lines are not even in the correct place on the windshield. They're too far inboard. Notice how they look in the prototype photo. They are Trico commercial wiper arms and curved blades. I have an original EMD Aerotrain pamphlet (among other Aerotrain memorabilia) which states ...... "The air-conditioned cars of the General Motors Aerotrain are an adaptation of the present body of the GMC 40-passenger intercity-type highway coach. ".....it goes on ......."Each car of the Aerotrain can carry 40 passengers in double reclining seats, each with it's own reading light. The GMC coach body has been widened 18 inches to give more comfortable seating space and a wider aisle." .......... Much other Aerotrain information is included in this wonderful, vintage brochure. Cool, that's getting it from the horse's mouth. So, it wasn't a converted bus, but just using the design of existing bus models, that makes sense. It sure looks like a bus. I found a site that has some interesting renditions of all of the Aerotrain Models. Scroll Down to the Second Page and down to Color Renderings of the Aerotrain.